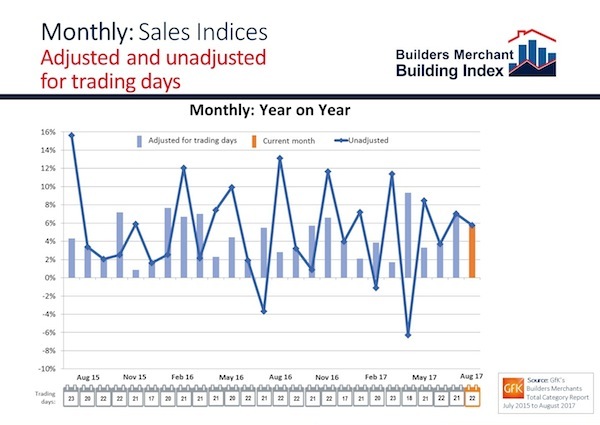 “The continuing growth of builders’ merchants’ sales over the summer months does not reflect the slowdown we’re seeing in general construction activity, particularly in London where sales of ready-mixed concrete have eased back during the year. “We believe activity has now peaked in the capital, although volumes remain at high historic levels. A weakening in overall activity was expected this year, reflecting the softer economic and construction outlooks post-referendum. “Looking forward, commercial and retail construction is expected to fall next year but major infrastructure projects such as Hinkley Point and HS2, plus Highways England’s road programme will help to steady the ship. “Builders’ merchants are an integral part of the supply chain and have been encouraged to adopt an Omnichannel approach to selling to future-proof their business. Amazon and other disrupters have created a new way of buying and selling, and their online model has been replicated across retail, influencing the way we buy. It’s been slowly moving into the merchant sector.